Little Troopers has lots of amazing gift ideas for you this Christmas, whether you are looking for a present for your Aunty or your little ones we have something for everyone. The Little Troopers Military Moments calendar is the perfect family planner for 2019. The collection of pictures showing some heart-warming Military Moments between children and their parents, who serve our country in the British Armed Forces, will provide the perfect backdrop to anyone’s year. The calendar is just £9.99 (plus P&P). Our military style hair bows will make a perfect stocking filler. They come in British Army, Royal Air Force and Royal Navy designs. You can choose from a large bow, medium bow or two small bows and they cost just £2.50 each (plus P&P). 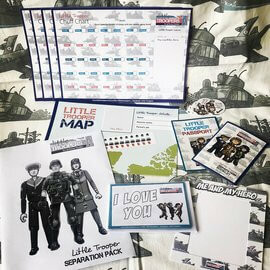 These are available in our online shop along with Little Troopers wristbands, dog tags and badges. If your little one is struggling with deployment or you want to help them get ready you could order one of our exclusive Dear Daddy/Mummy books. These beautifully written and illustrated storybooks follow military children through the life they lead and the situations they often find themselves in being part of a military family. Each book is £3.50 (plus P&P). Finally if you’re looking for something to keep you warm over winter have a look at our Little Troopers Hoodies. You can buy one for the whole family as they range in size from 6-12 months up to an XXL for adults. Prices range from £15 to £20 (plus P&P). Whatever you choose the profits raised through our shop sales go straight back into the charity and help us support even more Little Troopers. Little Troopers smiles – Oh no they aren’t – Oh yes they are!